The 2017-2018 season had some ups and downs for the wrestling team. 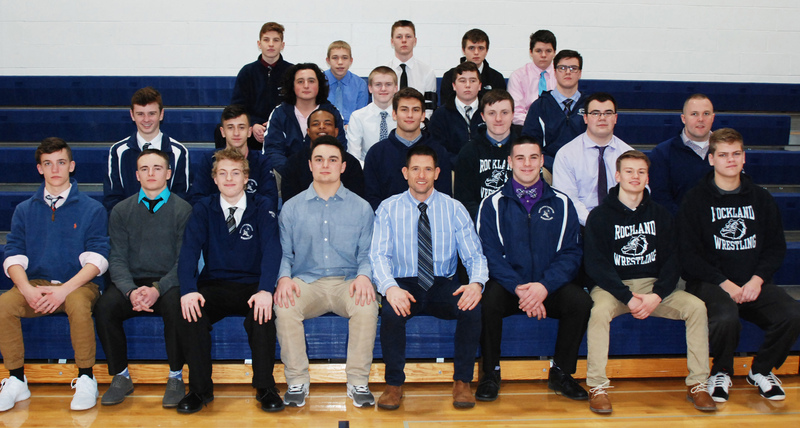 At the beginning of the season, the team was hit with injuries to two of its top wrestlers, senior captains Adam Russo and Will Breadmore. Both Russo and Breadmore were South Shore League All-Stars last year as juniors. These injuries would stop many teams dead in their tracks; however, the Dogs have been able to keep pushing forward and have forged a nice season for themselves, finishing with a 10-1 record. Although the Dogs came up short on a third consecutive league title, losing to a skilled Cohasset team, they are primed and ready to make an impact at sectionals, and the state tournament. After the league season ends, wrestling shifts into an individual sport where the goal is to have as many wrestlers survive and advance through sectionals, states, and all-states. Heading into sectionals assistant Coach Peter Harrison touched on the team’s new goals. “We are hoping to get two or three kids a sectional championship and their name on the banner,” said Harrison. Two kids expected to make a run through sectionals, states, all-states, and hopefully further are senior captains Cam Smith and Jimmy Fitzgerald as they have a combined record of 30-1, 15-0, and 15-1 respectively. Other wrestlers expected to make an impact are senior captains Adam Russo and Brad Seder. Coaches have lofty expectations for this senior group. “We are hoping our senior captains can take us far into states, all-states and even New England’s,” said Harrison. Although many wrestlers are not competing at this point of the season, as some do not survive and advance as far as others, one can still find the whole team practicing after school every day. Maintaining the team aspect of wrestling during the individual season is truly something special to Rockland High School Wrestling. That many athletes are no longer competing, yet go and battle at practice every day testifies to the dedicated culture of the team. Senior captain Jimmy Fitzgerald is thankful for the lessons he’s learned throughout his wrestling career. “Wrestling has taught me you can never take anything for granted; everything you achieve, you have to work for,” said Fitzgerald. The unsung hero for the team this season is Brad Seder. The senior captain has worked hard for four seasons, and was a leader throughout this season on and off the mats. The ‘Dogs are looking to make noise throughout their sectional, states, and all-state tournaments coming up. Look for some added names on the team’s banner as many of these grapplers could have a stellar run through tournament competition.